“My farm crops are free from pest or disease after using vermicompost. Earlier I faced the issues of rot disease but now it is all gone. I could also see the change in quantity of yield. 10 years before I used to get 10-15 quintal arecanut, 10-12 kg pepper but after using vermicompost the yield has increased 25 quintal arecanut, 3.5 quintal pepper, betel leaves 15,000 – 20,000. Coconut obtained is 15,000. Consequently my farm revenues have increased. 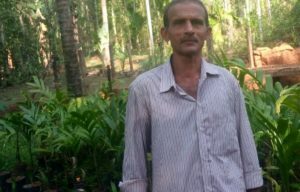 Vermicompost manure has the capacity to turn alkaline soil into fertile soil,” affirms Mr. Prabhakar G. Bhat Mankoji, 55, farmer from Kadle village, Uttar Kannada district, Karnataka. The total farm area is 8.5acres in which 2.5acre has arecanut cultivation (1000+ trees) with pepper and betel leaf climber, 1.5acre coconut (160+ trees), 1 acre of fodder cultivation for cattle, 0.5 acre forest trees (teak, terminalia elliptica) and 3acre cashew plantation. 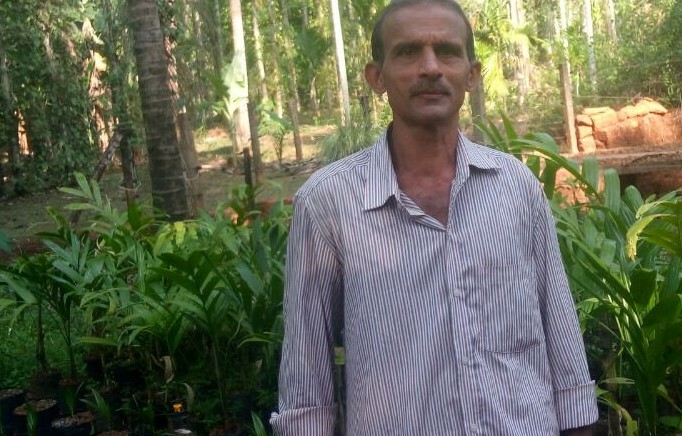 “Now I have planted pepper climbers for 100 coconut trees. I pursue cow based farming process. I rear 6 desi local breed cows of Karnataka, 1 buffalo and 2 calves,” he informs. He has 8 vermicompost tanks, 20ft long, 4ft wide and 2.5ft high. “I use 2 kg vermicompost manure for arecanut tree and 5 kg for coconut tree,” he adds. Vermicompst worms used in the farm are African breed, Eisenia Fetida and Eudrilus Euginie. “Initially I used desi worms in vermicompost tanks but the conversion process was slow therefore I switched to these exotic breed of earthworms. Its performance to turn waste into compost is must better than the desi earthworms,” he shares. All the tanks have 3 inch slope and there is a pipe connection at the bottom connected to the underground tank. The water or vermiwash from the tank goes to the tank through the pipe. “It is done such that not even single drop of water will be wasted. 1year is needed to convert whole tank into compost, if procedure is followed properly,” he informs. The conversion process of waste into manure in vermicompost begins after 2 months. “Entire waste to be filled in the tank is coated with cow dung slurry to improve the process efficiency. After the tank is filled with waste, the worms are introduced and then after we spray cow dung water to avoid drying of the waste. Cow dung water initiates the process of reproduction of worms. The tanks are then covered and left undisturbed. The moisture content from the slurry also helps to maintain the dampness in the waste. In addition I spray water gently on the top surface of the tank once in a week,” he explains the process. When asked about covering the tanks, “We have rats and frogs in the farm that eat the worms therefore as a precautionary measure we keep the tanks covered with 5ft square mesh. Around the tanks I have made a small channel to fill water for avoiding rats and ants,” clarifies Mr. Prabhakar. “After one month I will remove 6 inch compost and pour cow dung slurry. It implies the slurry will be 2inches above on the dry tree waste. We can remove 0.5ft compost once in 15days from 2 month onwards and add cow dung slurry as and when compost is removed,” he shares. On an average 25 quintals vermicompost is obtained from one tank. Worms are one time investment as with natural reproduction process the worm multiplies. Mr. Prabhakar took the loan of Rs. 1.2lakhs and received Government subsidy of Rs. 30, 000. Earlier I was selling vermicompost and worms at Rs. 400/kg but after 2013 I discontinued as it is used completely in my farm. I put 2 kg vermicompost for each arecanut tree and cover it with dry tree waste to protect the compost. Then water is sprayed through sprinkler from the well. Alternate years I add new soil to the trees,” he shares. Mr. Prabhakar recommends taking training from the person engaged in vermicompost for a long time. The training must be at his farm as practical aspect is most important. “My first attempt in vermicompost was not successful due to insufficient quantity of cow dung used in the process. I left it for almost 1.5years and then started again under the guidance of a person practicing vermicompost for a long time. I changed the method and then gained the breakthrough in converting waste into manure through vermicompost process,” he reveals. Coconuts are sold near the farm at Rs. 35/kg, arecanut is sold to Campco company at Rs. 20 thousand/kg, pepper in Kumta market at Rs. 40 thousand/kg and betel leaves in local market. In time to come he plans to plant pepper climber on remaining coconut and forest trees in the farm. “Farmers must use vermicompost as it is the best for all crops and soil. It would reduce the production cost and increase the yield thereby overall farm revenues shall surely increase,” he concludes.